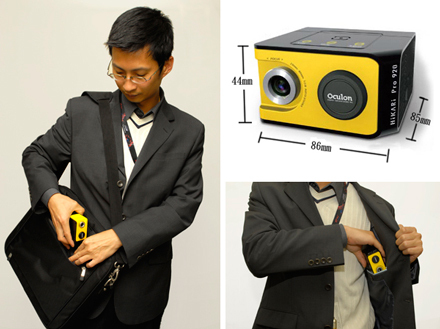 Hikari Pro920 Projector From Okulon Is Tiny, Looks Like Retro Camera | OhGizmo! By David Ponce on 11/23/07 • Leave a comment! We’re still waiting for Microvision to get their super-projector properly integrated into our cellphones. But we’re not quite there just yet. 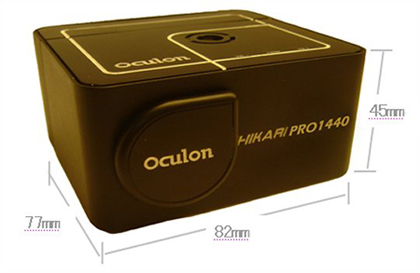 Meanwhile, if you’re looking for a tiny, boxy projector that will throw a usable image (15 to 20 inches) from just two feet away, then look no further than the Hikari Pro920 (pictured above) or Pro1440 (pictured after the jump) from Taiwanese outfit Okulon. The Pro920 is $300 and projects 15 inches at 25 lumens, while the Pro1440 steps it up a little with 250 lumens, for a 20 inch image. It costs $400.